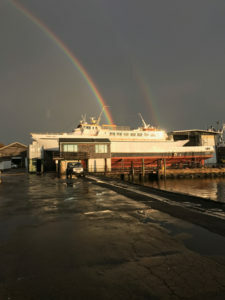 Photo by Ray Harding of Fairhaven Shipyard, November 2017. Click on photo for a larger image. 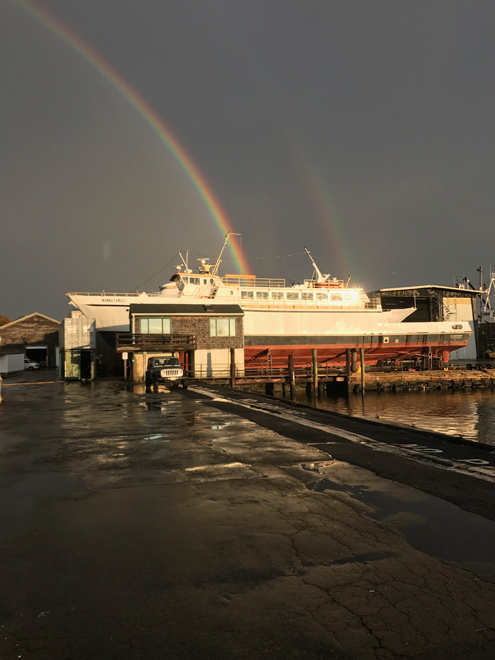 Fishers Island Ferry District’s Munnatawket transited to New Bedford, MA, November 8, 2017. She is scheduled to return from the Fairhaven Shipyard in January, if there are no delays. 1) Weld repair +20 locations on pass deck hand rails. 2) Install A-60 structural fire protection in engine room. 3) Renew approx. 160sq ft of hull plate. Various locations. 4) Open inspect sewage tank and replace plate as needed. 5) Blast renew plate as needed, prime and paint ballast tank. 6) Install heated windows in pilot house. To keep them ice-free in winter. 7) Install windshield wipers on pilot house windows. 8) Overhaul starboard generator motor. 9) Renew anchor windlass foundation and associated wiring. 10) Overhaul car deck sprinkler valves. 11) Pressure wash and paint bottom. 13) Upgrade pass cabin lighting. 14) Upgrade wheel house heat and some systems. 15) Install new cleat starboard side to better match new dolphin locations.